Jacques Couvillon: What’s funnier than a chicken farm? In a moment of clarity, Jacques Couvillon quit his day job with the dream of becoming a writer and no clue how he would get there. Seven years later he is celebrating the publication of his first novel, The Chicken Dance, the story of a boy who finds overnight celebrity when he wins the chicken judging contest in his hometown of Horse Island, Louisiana. Couvillon took time out from writing the book’s sequel to answer some questions for That Other Paper writer Nicole Haddad. That Other Paper When and how did you realize that you wanted to become a writer? Jacques Couvillon I’ve known that I wanted to be a writer since I was 10 years old. I started writing stories, and in journals, up until I graduated from high school. By this time, I’d kind of given up the dream of becoming a writer, because I never thought that anyone would want to hear what a farm boy had to say. When I turned 30, I decided that I wasn’t happy, and since I didn’t appear to be getting any younger, I figured I should take action and change my life. And that is when I pursued writing seriously. TOP You say on your website that the greatest lesson you learned from studying writing was not how to write, but what kind of writer you are. What kind of writer are you? JC I’ve realized that I will never pour out beautiful prose like some of the greats. But I’ve also realized that it’s okay. I think some people like to read a story that feels like a conversation with a good friend. That’s how I feel most comfortable writing. I want the reader to feel like I’ve dropped all of the barriers, and I’m telling them my secrets in good old fashion, plain English. TOP What are the best and worst parts of the writing process? JC The best is getting started. The worst is getting started. I love the thought of where a writing project can take me. But it is also very intimidating, because sometimes I feel like I might end up in a place that I don’t want to be. 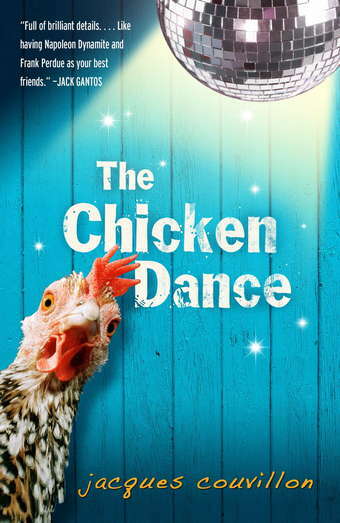 TOP Describe your book, The Chicken Dance, in one sentence. JC A zany, madcap, out-of-control, dark comedy about an 11-year-old boy whose life is turned upside down when he becomes the youngest person in history to win the chicken-judging contest at the Dairy Festival in Horse Island, Louisiana. TOP Where does the title of the book come from? JC It’s kind of a long story but I’ll give you the abbreviated version. The book was the result of a two-page writing assignment in a class I was taking. The original story was called Dance and was about a little boy whose mom made him dance in the middle of a grocery store. 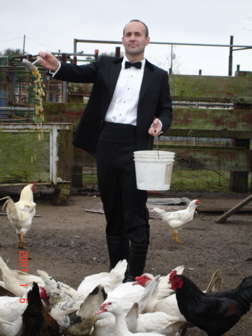 I put him living on a chicken farm simply because I thought, “What’s funnier than living on a chicken farm?” But once I began working on the book, I realized how much flavor – no pun intended – the chickens added. Then it was just a process of thinking and trying new things. For a couple of months, it was called The Dancing Chickens. But as I wrote, I realized that the real story I wanted to tell was about how everyone has their own chicken dance. TOP Where did you get your inspiration for the book’s main character, Don? JC Don is the combination of the kid I sometimes feel like, and the person I always wanted to be. TOP The Chicken Dance is marketed toward young adult readers. What do you think an adult reader can get out of reading a young adult book? JC It’s funny you should ask that. I originally wrote the manuscript for adults but because I had an 11-year-old narrator, I sold it as a young adult novel. So I started reading young adult novels to scope out the competition. I was really surprised by the many adult themes that these books have. I think most of them were written to help young adults deal with the many issues that surround them. But I realized that adults also deal with many of these same issues. I also benefited from remembering what it’s like to be that age. This helps tremendously when I’m trying to communicate with young adults. TOP Who are some of the authors that have inspired you, not just in the writing of this book, but as a writer in general? JC Well, of course, Judy Bloom. Are You There God, It’s Me Margaret helped me get through my teenage years. I try to read a variety of different authors to learn about different styles. I think my three favorite have been Jose Saramago, Hans Ulrich Treichel, and Alessandro Bariccio. I find that they tell great stories in a non-traditional way. TOPWhat is your favorite punctuation mark and why? JC I would have to say a question mark, because every time a question is asked, there is potential for a new story to begin. TOP You’ve lived all over the country, but you’ve said you hope one day to become a permanent Austinite. What draws you to Austin? JC There are so many things I love about the city like the architecture, the nature, and those amazing oak trees with the spiral-like branches. But what I love most about Austin are the people. They have their own sense of style and encourage you to have yours. There doesn’t seem to be fear in people’s eyes of being judged because they don’t judge others. Everyone seems so confident and at peace. The city is an example of diversity living in unity. It is truly an oasis, where people respect each other, themselves, and the environment that surrounds them. TOP Tell me about your next book. JC I just finished the second manuscript last night and sent it to my agent. So this may change, but I’ll tell you what I’ve written so far. I send Don to summer camp. I wanted to get rid of all of his securities including his chickens, KC and the Sunshine Band, his best friend, his blue ribbon, his parents, and his pretend twin brother. While at camp, Don falls in love with an older woman. And for the first time in his life he speaks to African-American kids. They take him into their group and teach him how to rap. The book is called Strut, and it is about listening to what our body is telling us. Again, all of this may change once my editor gets a hold of it. If you’d like a preview, I posted a chapter on my blog. Find out more For more Jacques Couvillon, check his website. The Chicken Dance is available at bookstores now and makes a great gift for any reader on your list.